Usually you will only choose one nail shape, but have you thought about trying two? These nails are mostly coffin shape but there are two stiletto nails on each hand. 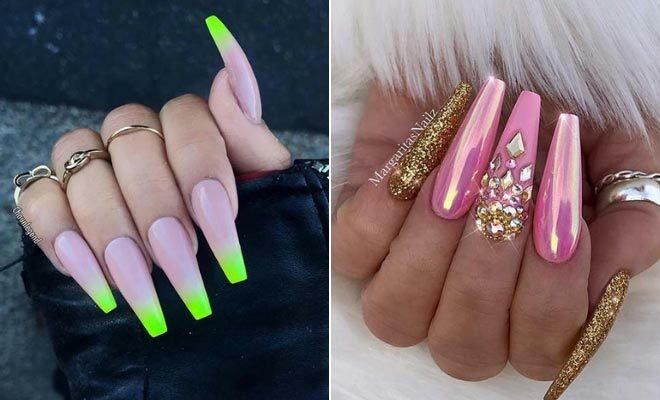 As you can see, this mix of nail shapes looks super cool and trendsetting. You can try any nail shape but just try to keep them a similar length. 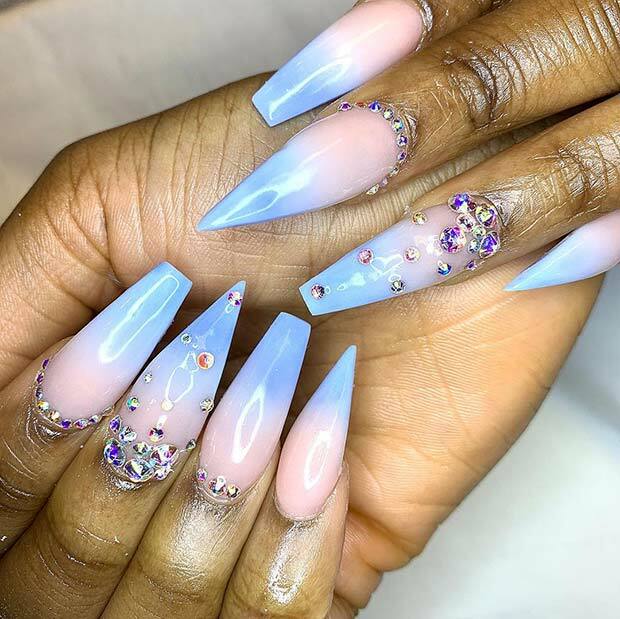 Recreate this blue look or use the different nail shape with any colors or art. Our next idea features another must-have combination. 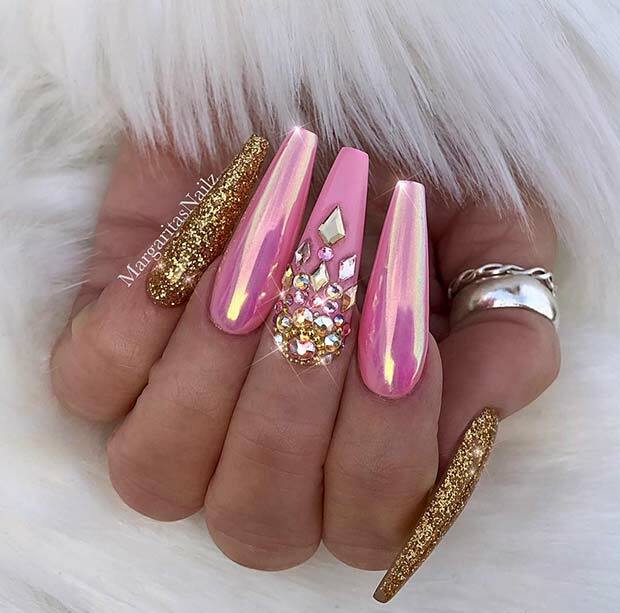 Some of the nails are gold glitter, two are pink chrome and the last nail is pink and covered in crystals. We love this design because it has it all – sparkly glitter, beautiful bright pink and trendy chrome. It is the perfect mani for someone who likes to keep their nails looking fresh and on trend. Next, we have another bold blue look. 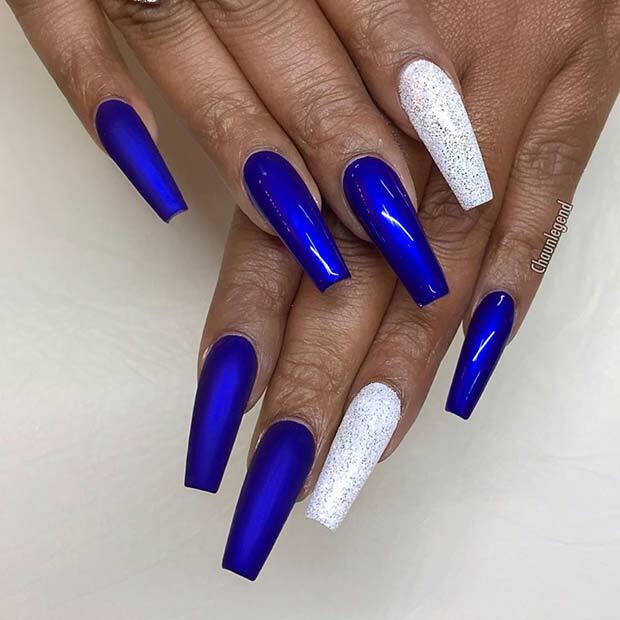 This nail idea features matte blue, glossy blue and white nails with silver glitter. It is a bright and stylish design idea that can be dressed up or down to suit any occasion. You can try the whole look or just either matte or glossy with the glitter accent nail. If you like your nails to have lots of glitter and sparkle then you need to check out this next design. Most of the nails are a soft pink shade and there are two accent nails. One accent nail has sparkling stripes and the other is covered in rhinestones. This is a creative, artistic and stunning look. Creating stripes yourself can be difficult but there are easier ways to do it with things like stencils and tape. You can find tutorials online. Black and white are two colors that compliment each other perfectly. 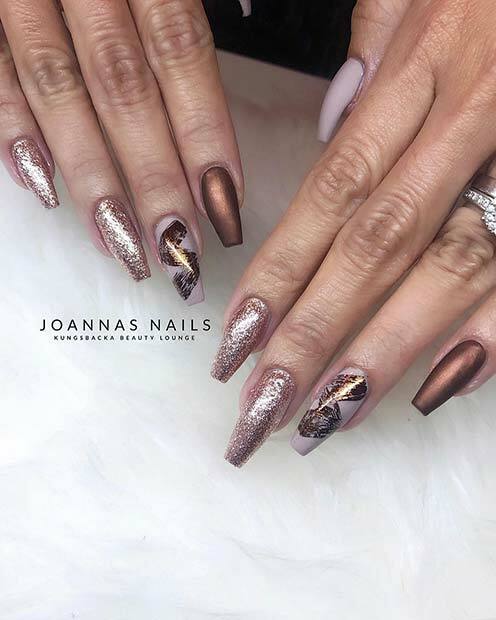 These nails show an amazing way to style the two colors. 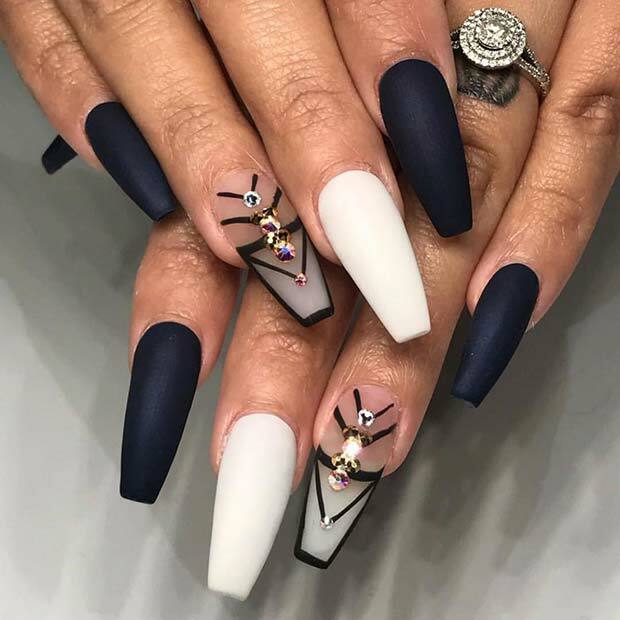 Some of the nails are matte black and there are two accent nails. One accent nail is matte white and the other is frosted with a black pattern and gems. This is a gorgeous idea and you can recreate the manicure with just black and white nails. 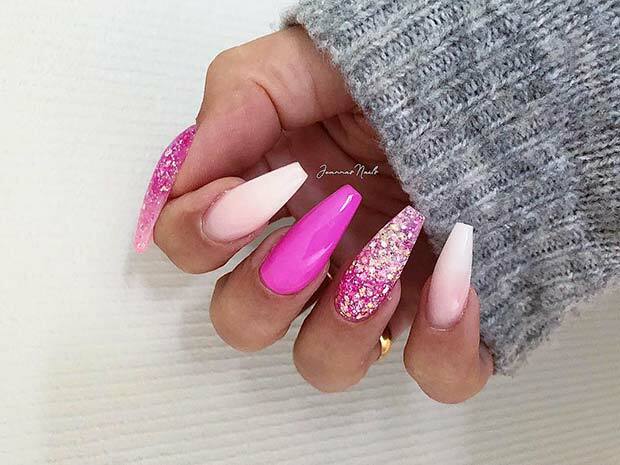 Love the pink nail ideas? Then these long coffin nails are for you. Three of the nails are sparkly, two have glitter and one is covered in rhinestones. The rest of the nails are just light pink. This is a gorgeous design that will add glitz and glamour to your look. You can try the whole design or just pink and rhinestones or pink and glitter. Our next idea is another burgundy look. This one features a matte burgundy and each nail has a different sparkling design. It is a glam look that could be quite simple to recreate. Just paint your nails in a similar color and attach the rhinestones. You can try to recreate this look or try your own crystal design. 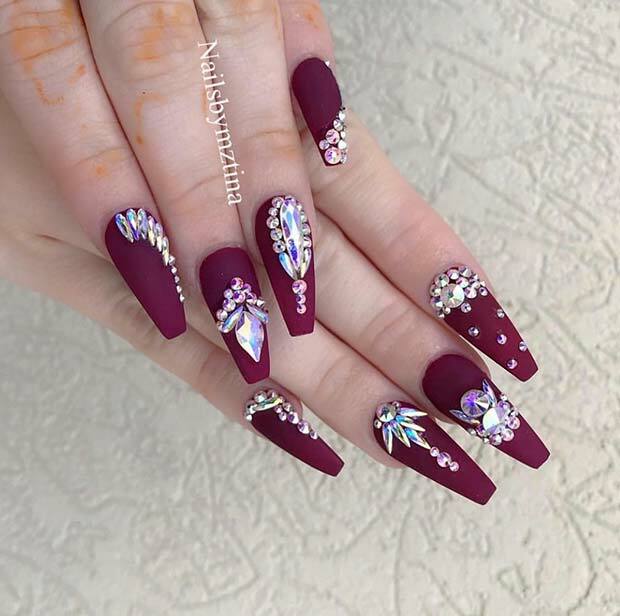 Nails like these would be perfect for a party. Next, we have another glam nail idea. Most of the nails have a different design. Some nails are glittery, some are brown, one is a light shade and there is a trendy paint stroke accent nail. This is a cool and stylish idea that will suit everyone. You can check out all the colors used to create this look on the artist’s page featured below. 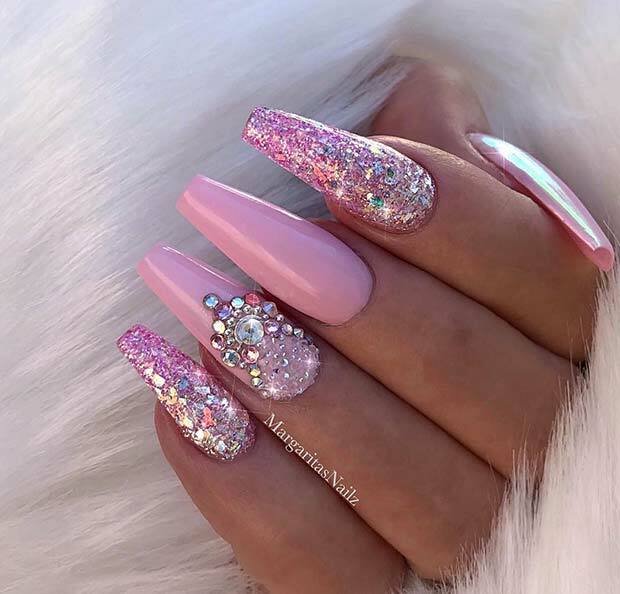 Love pink and glitter? Then check out these next nails! 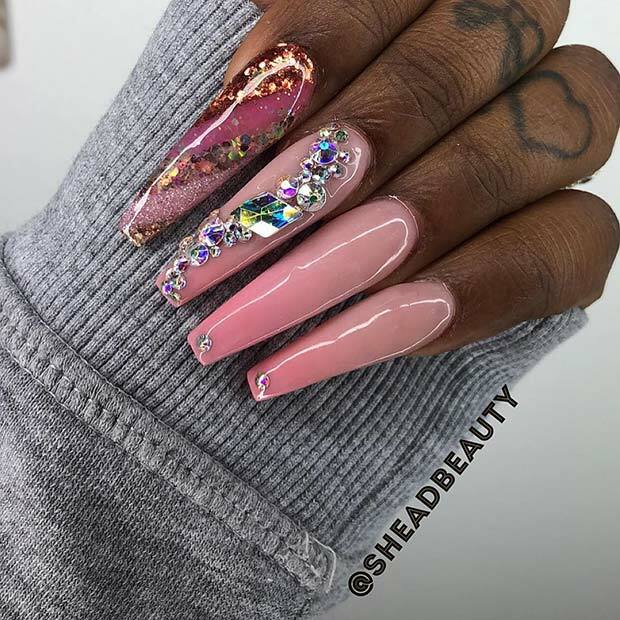 For this design some of the nails feature a subtle French ombre, two nails are covered in sparkly glitter and the last nail is a vibrant pink shade. This is a gorgeous nail design that is perfect for the ladies who like to look pretty in pink! 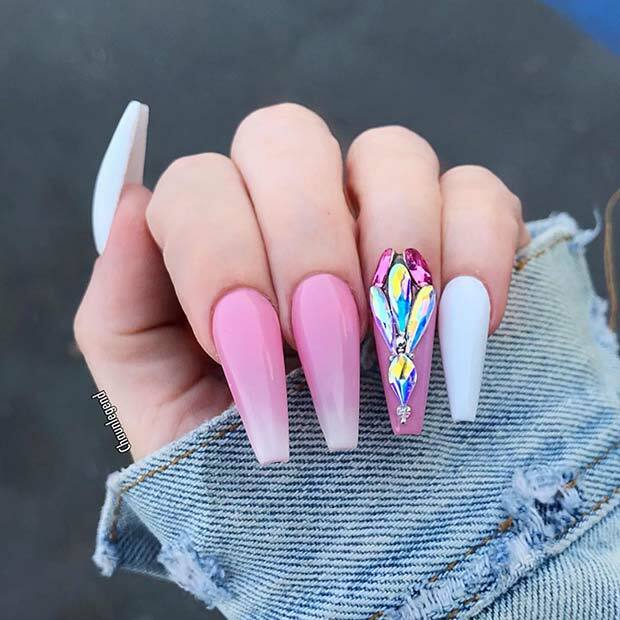 Looking for beautiful nails that will make you stand out from the crowd? Then these are for you! Here we have a blue manicure idea where most of the nails have a different design. 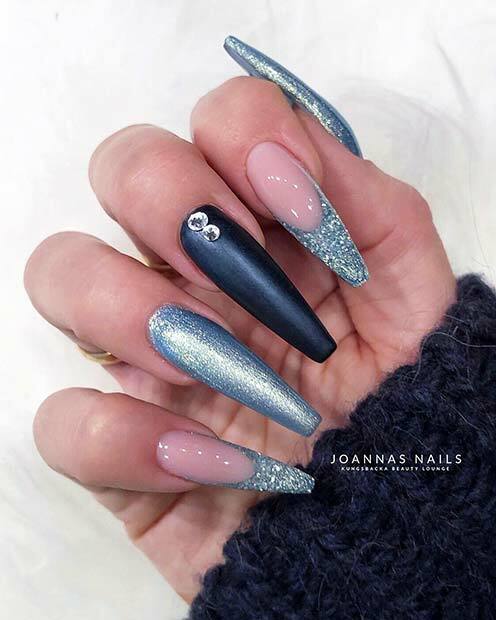 Some nails are a metallic blue, two nails have a glittery French manicure look and the middle nail is dark blue with gems. This is a stunning icy design that will look amazing all year round. You can check out the products used on the page below. The last idea we have to show you is this pink and white mani with a gem accent nail. This is a pretty, elegant and bold idea. The tips on the pink nails are a slightly different color which gives them a subtle ombre look. An idea like this is perfect for the ladies who want a sparkly, fun and vibrant set of nails. We hope you have found inspiration for your next manicure!